Last week I tried an experiment with my toddler time group, and wrote this post: Infographic Story Stretchers. Yesterday, I had an opportunity to follow up on last weeks experiment. Guess what? It was a big success!! 1) My toddler time parents gave me wonderful feedback, and were eager to collect this week’s infographic (Hi, Pizza Man by Virginia Walter). All in all, I would say that the experiment was a success! Not only will I continue to make infographics for my storytimers this session, but I also hammered out the format to make this a clear-cut task. 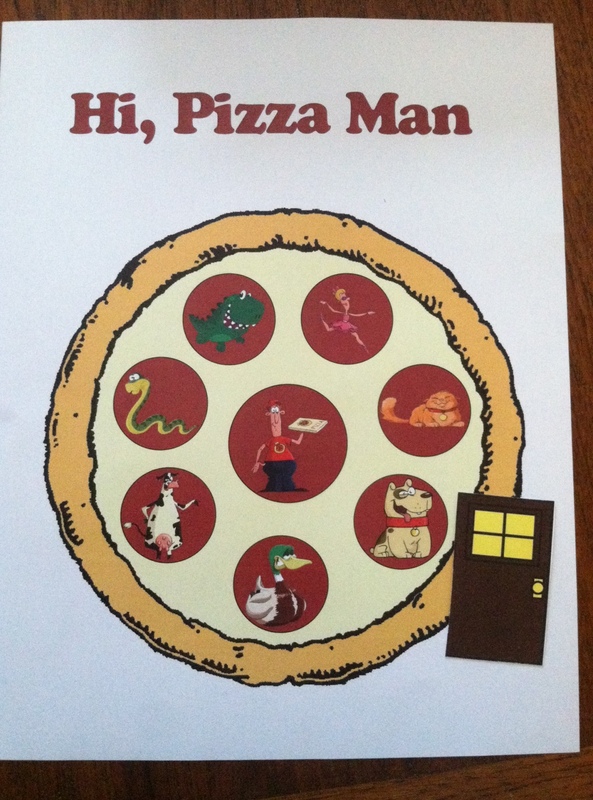 And finally, this week’s infographic is based on my all-time favorite storytime book: Hi, Pizza Man. The first page is as you see if above, and the second is a bunch of little doors. I printed the first page 20 times, and the second page once. Then I cut up all the little doors. Each storytimer gets one infographic and one door. At the end of storytime I passed them out, and demonstrated how to use it later to retell the story later. I just realized I forgot to send myself the PDF, so I will post it tomorrow. The magnificent Mel Depper is hosting this week’s special Valentine’s Day Flannel Friday. And it just so happens that we are coming upon the third anniversary of this wonderful tradition. So big XOXOXO’s for Mel. Thanks for hosting! This is such a genius idea. I’m going to steal it immediately! Thank you so much for sharing. Hi Cate from another library Kat(i)e! This is a really interesting idea, and I’m excited to share it with my co-workers and librarian friends. I’ve been putting on STEM programs this past year, and like you, I had this AHA! moment during a sink/float experiment when my preschoolers kept asking if they could bring the marbles home. No? Could they take home the feathers, then? What about the super gross, soggy cotton ball that was more of a cotton pancake now? They wanted something more exciting than just a handout with the program information, so I’ve been trying to come up with ways to include a take home project or supplies for a take home project. Finding something that relates well to the program and will be memorable a few days or even a few weeks after the experiment is a challenge, but I’ve had a positive response from families, so I’m working to continue it. 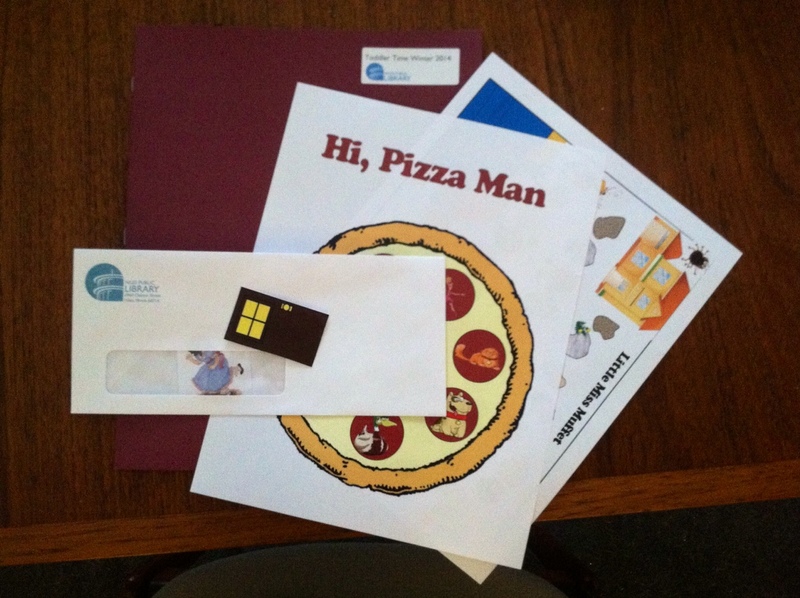 I love the idea of something simple and interactive coming home from storytime, and the folder idea is totally steal-able! Thanks again for sharing your great idea and I can’t wait to brainstorm some fun take homes for upcoming storytimes!! I’ve been dreaming up ways to do this with STEM activities too. We’ll put our heads together! Inspired by your post and an idea I found on pinterest, I made up something similar for Chicka Chicka Boom Boom. I would be happy to share it with you if you like! Please do! I’d love to see it. Can I add you to the infographic google doc? Cate, I’m loving this idea of yours. I look forward to trying it myself one day. Please do! In fact, I’ve started a wishlist & so far 1other librarian wants to work-share it with me. printables like this are perfect for collaboration. I can share the wishlist (google spreadsheet) with you if you’re interested.